Once you’ve carved the pumpkin and hollowed it out, adding lighting is a very important part of creating the atmosphere. Traditionally, a candle is inserted into the pumpkin but there are also other possibilities for creating the light inside. This article will guide you through some suggestions for lighting your Halloween Jack-o-Lanterns. Finish carving your pumpkin. When carving the pumpkin, consider where to place the access hole for adding lighting: A bottom hole is ideal for windy, blustery nights. The surrounding pumpkin will protect the lighting from being blown out and the hole is placed on the ground or a solid surface. A hole on the top of the pumpkin, which looks like a lid, using the dried stem as a handle. This is the old-fashioned way. Use candles. 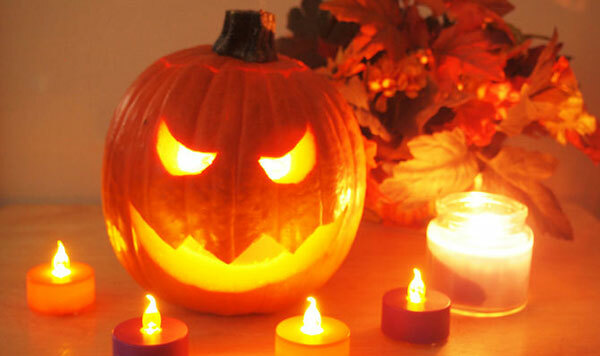 Candles are the traditional way of lighting a pumpkin and they're still much in use today. For the pumpkin with a simple base hole: Light the candle first. Place the pumpkin straight over the candle wherever you'd like the pumpkin sitting. 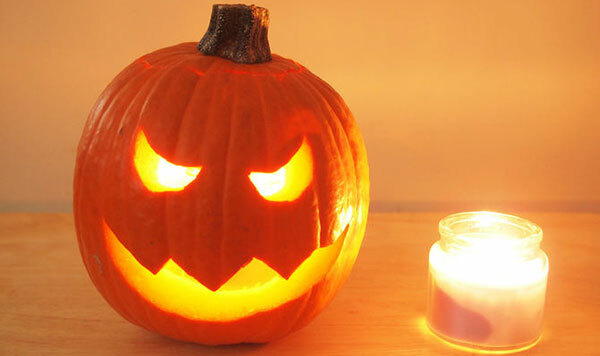 For the pumpkin with the top lid: don't try to light the candle first and then stick it down inside. You can burn your hand trying to do this. Place a non-lit candle in through the lid space. Make sure it's sitting firmly on the base of the pumpkin and will not fall over. Light the candle. Don't try to reach from the lid. 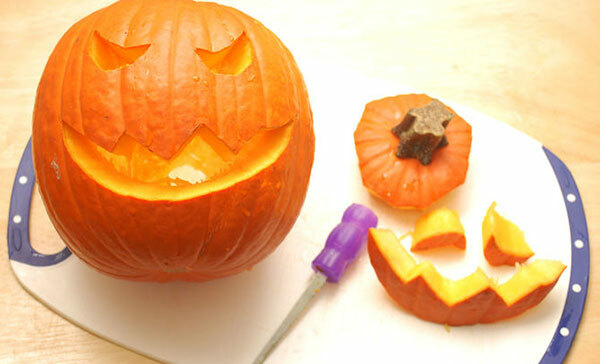 Instead, using a long fireplace match or a longer lighter, go through the front of the pumpkin, where it's carved. You won't burn yourself using this easy method. 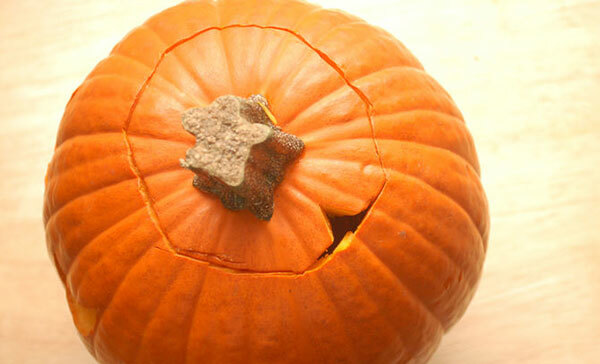 Create a chimney hole to release the heat from the inside for either style of pumpkin. The candle flame heat rises and will eventually burn a hole in the top of the pumpkin and start cooking the pumpkin from the inside out. To deal with this, light the pumpkin's candle and leave it to burn for a few minutes. You'll then see where the heated area is forming on the top of the pumpkin. Use the lid-cutter saw and cut out a little edge at the top. Remove the piece. There will be be a little chimney left to release the heat. Use a battery powered light. If you're worried about the flames harming pets with their long tails or kids with their cloaks dangling around, a battery powered light can provide a safe alternative, and they're inexpensive. You don't have to worry about leaving these unattended, and they won't blow out with the wind. There are several different types of battery powered lights on the market. Some have regular white glowing lights, while others have a red glow, which can mimic a candle flickering in the pumpkin. Kids love the rainbow glow light. It's a good one for a monster pumpkin for a spooky effect. Place them in the pumpkin through the available hole. Consider using other types of lights. Be creative and use other lights you have around the place, such as flashlights, lamp lights, ball lights, etc. Just be sure to tuck away any cords if you use a corded light. 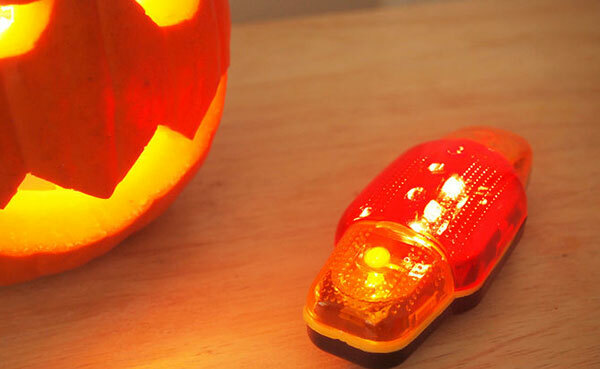 LED lights made for bikes, headlamps, etc., can make cool pumpkin lights. 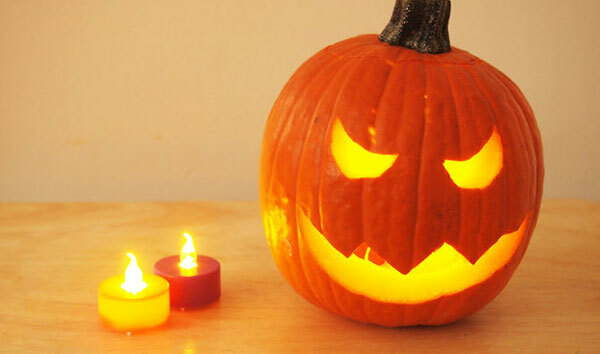 Set up a ball light by turning the switch on and then placing it flat inside the pumpkin. Enjoy your lighted pumpkin display. If you can, remember to take photos as lit pumpkins make for memorable photos.